Delighted Clipstone boss Chris Millington had a smile like a Cheshire cat after his side’s convincing 4-1 win over Retford United in the semi-final of the Notts Senior Cup on Tuesday night. That booked Clipstone’s place in the final at Mansfield Town’s One Call Stadium, their first since 1993, on Thursday, 30th April where they will play Basford United, who overcame Dunkirk 4-2 in the other semi-final. The game started as a close encounter with both teams sharing equal amounts of possession. It was not until the sixth minute when the first corner of the game was awarded, Retford being the recipients and Clipstone defending well to clear any danger. The first shot in anger was by Clipstone’s Matty Ord, as he cut inside from the left and unleashed his effort with the Retford keeper saving well low to his right. With 12 minutes of the game played Clipstone won their first corner of the half, which was quickly followed by their second. This one was only half-cleared, again to the feet of Ord, and he played in Josh Gibson who, in turn, found Dan Wood, whose fierce shot was parried away well by the visitors’ keeper to keep the scores level. Clipstone were starting to find their rhythm and it was somewhat against the run of play when the first goal was scored. 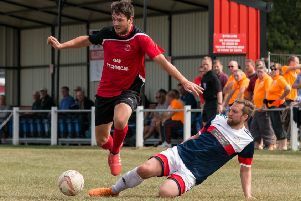 Retford had found their way deep into the Clipstone half and Brandan Shaw made sure of clearing the immediate danger as he put the ball out for a corner. However, as the ball came over, Stu Hill headed out of the area towards Luke Hadley, who managed to steer a volley past the Clipstone defenders, leaving Nick Siddons little chance of saving. Within a minute of the restart the hosts were back on level terms. Again Ord was the instigator, playing in Callum Mawby, his shot deflecting off Josh Gibson and beyond the despairing keeper on 15 minutes. On 23 minutes Shaw made a wonderful 40-yard run from inside his own half on the left of play, leaving several defenders in his wake, but his shot was deflected wide of goal and a corner kick was given. Rob Paling swung the ball right under the crossbar, which was flicked on to the far edge of the six yard box where Karl Colley was left unmarked, and he looped his header over everyone and underneath the crossbar to put the Cobras 2-1 up. Retford, to their credit, tried to get themselves back into the game and did enjoy periods of possession, unfortunately for them the Clipstone team were defending well and snuffing out everything that was thrown at them. On 40 minutes Wood was played in by Paling over on the right. He jigged his way past two defenders and hit a blazing shot that the Retford keeper was pleased to get any part of his body onto the ball, and he grabbed the ball at the second attempt. Clipstone got the second period underway, but Retford had come back out out fighting, both teams hustling one another, giving no time to sit on the ball. Ord looked frightening when running with the ball. He was making way at pace through the Retford midfield and was pushed from behind 25 yards out from goal. Again Paling took the set piece this time to the near post, which was flicked back by Wood to Karl Colley, who blazed a shot on goal. But the pace of the shot would not allow it to dip in time and it went for a goal kick. Clipstone were finding more space in midfield as the second half went along. On 54 minutes Gibson flicked a ball on from just inside the Retford half, Mawby raced through and found himself one on one with the keeper. Mawby went for the chip over the keeper and succeeded in doing so, only to see his effort rebound off the crossbar. Most of the attacking play was coming from the hosts, but it was not until the 84th minute when the next goal of the game arrived. Ash Rawson played a wonderful 40 yard ball across the field of play to find Wood on the far right. His cross was slightly over-hit but Mawby was alert and managed to wrap his foot around the ball to centre for man of the match Gibson to grab his second and Clipstone’s third of the game. With time running out and Retford pushing forward, trying to get something out of the game, another through ball from Gibson let in Ryan Damms to burst through the middle of the park and rifle a shot low to the Retford keeper’s right post to score probably the best goal of the game.